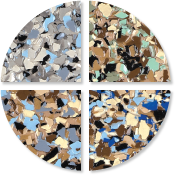 Due to monitor limitations some colors may not accurately represent actual colors. 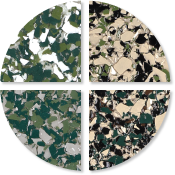 To confirm your color choices obtain samples from your authorized representative. 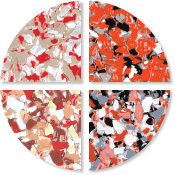 We manufacture color CHIPS for use as a design element in durable, seamless flooring systems. 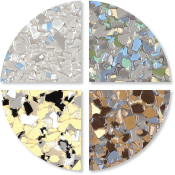 Our CHIPS (also known as flakes or flecks) are the highest performing brand available, and are used to enhance all types of residential, commercial, and industrial environments, from garages, utility rooms, and basements to high-traffic corridors, restrooms, warehouses, and retail spaces. 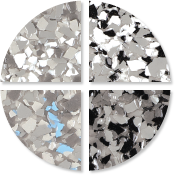 Solid colors are available as 1 inch (random), 5/8 inch, 3/8 inch, 1/4 inch, 1/8 inch, 1/16 inch, and 1/32 inch CHIPS. Our most popular sizes are shown below. 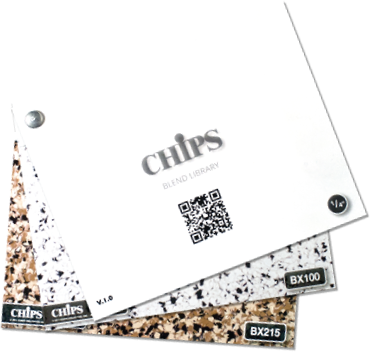 We manufacture 30 standard solid color CHIPS and 10 standard striped color CHIPS. 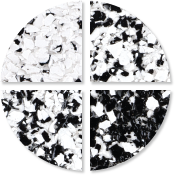 We also produce fluorescent (black light activated), phosphorescent (glow-in-the-dark), and metallic color CHIPS. 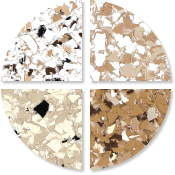 Please ask us for samples! 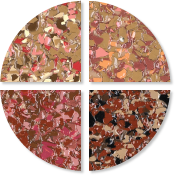 If you would like colors we do not show on our website or color chart -- simply provide us with something to match and we will produce the colors you desire. 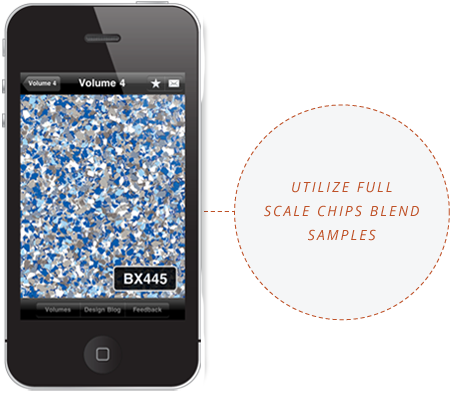 We can create blends from any combination of CHIPS – just tell us the colors and ratios you’d like. 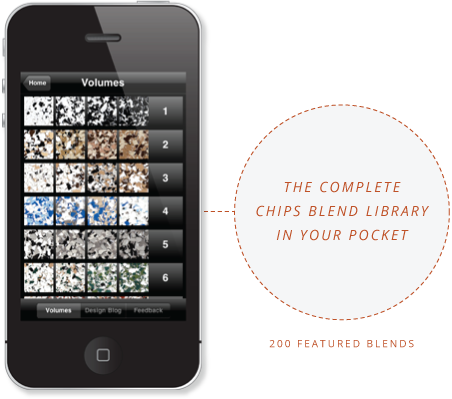 View our 200 featured blends in the Blend Library App or the Blend Library Fan Deck. 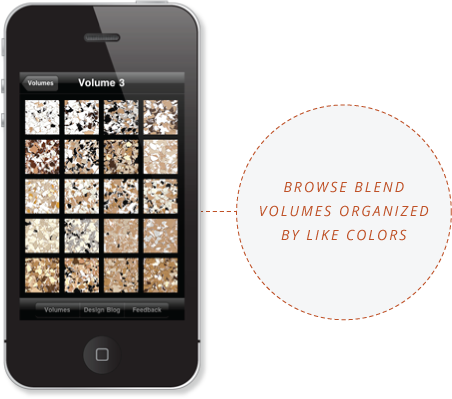 Don’t see the color or blend you need? 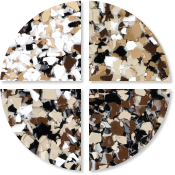 Simply provide us with any type of sample—a piece of natural stone, a concrete overlay, a wall treatment, a color palette, a company logo, etc. We will match it. Please call us for assistance! 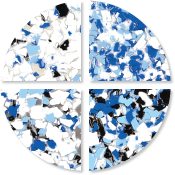 CHIPS Unlimited, Inc. recommends compatibility testing with resin systems prior to application. 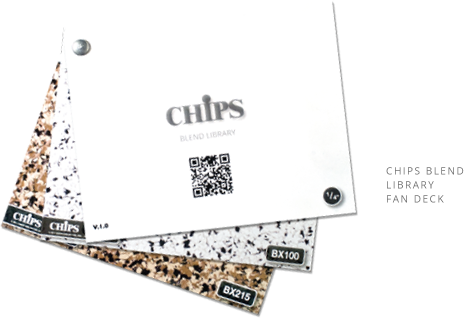 Includes all 200 featured CHIPS blends in both 1/4" and 1/8" sizes. Our fan deck comes with a protective carrying case. Swatches are anchored with a brushed aluminum Chicago screw for easy access. 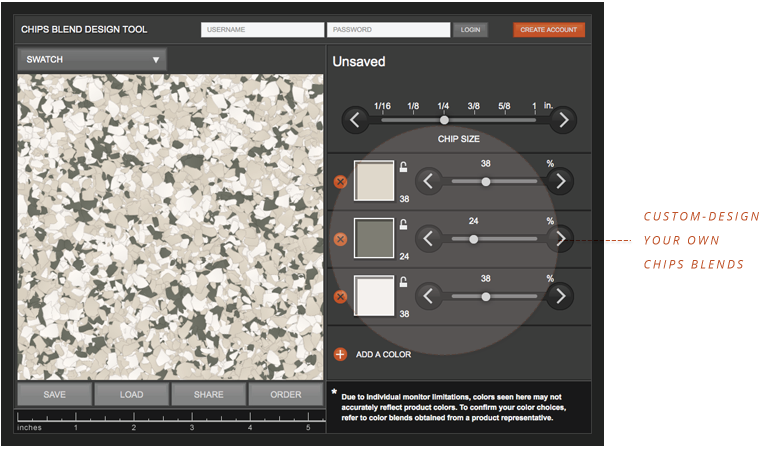 A perfect tool for architects and sales professionals. 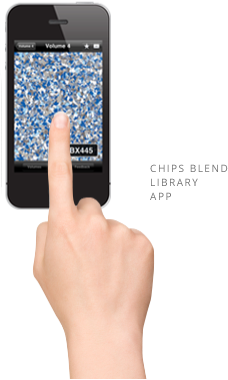 Keep all 200 featured CHIPS blends in your pocket with this user-friendly smartphone app. 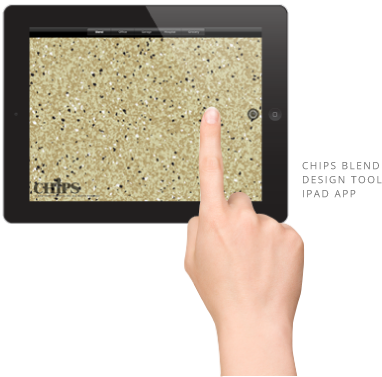 See blends at scale, share them easily, and link to the CHIPS design blog for tips and inspiration. 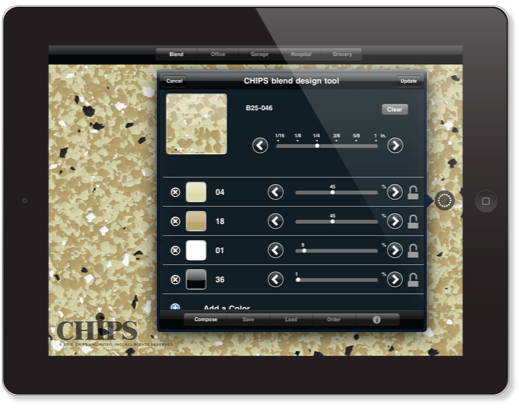 The CHIPS Blend Design Tool makes designing customized seamless flooring an elegant and efficient process. 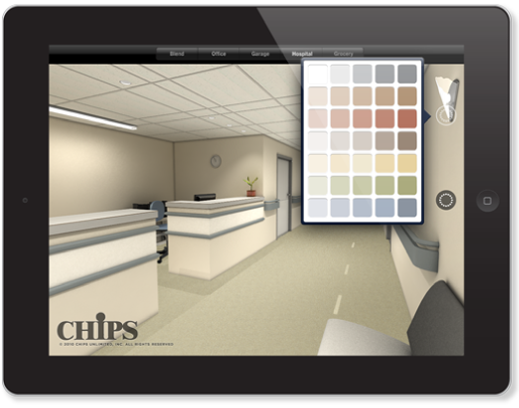 This intuitive online tool enables you to customize CHIPS colors, sizes, and blends and visualize them in realistic settings. 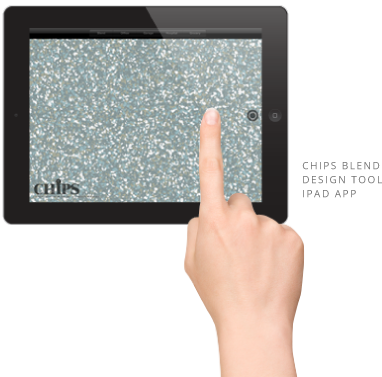 This tool will function on mobile devices with an internet browser. Save a link or bookmark to your home screen for easy access. 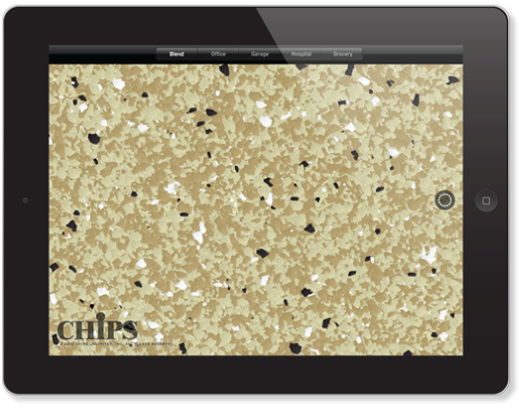 Use the iPad display as a design palette to support real-time development of custom chip blends—at your desk or in the field. 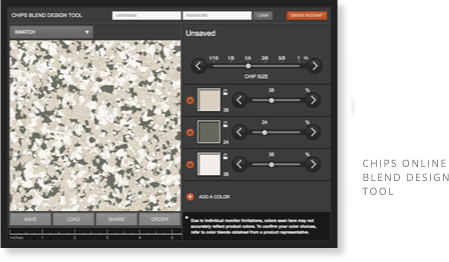 With the CHIPS Blend Design Tool App, designing customized seamless flooring becomes a more elegant and efficient process. 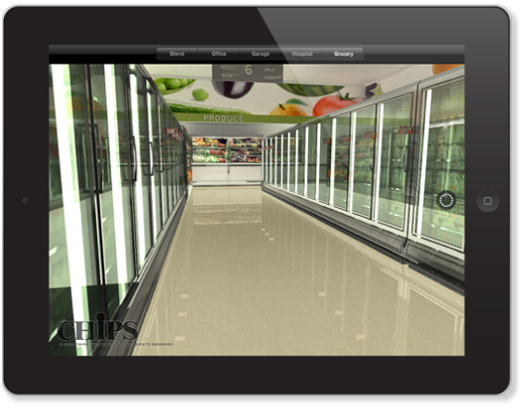 This intuitive app enables you to customize CHIPS colors, sizes, and blends; visualize them in interactive environmental simulations; share them with others; and order samples.